The online bookmarking functionality I use most often isn’t Delicious or Google Bookmarks or even my browser’s bookmarking area. Instead, I use Instapaper, a really simple way to store things that you want read or come back to later. And the service just got a series of updates over the weekend to make it even better. The biggest update is the addition is the addition of folders. You can now better organize the stuff you bookmark. Developer Marco Arment calls this “by far, the most requested feature in Instapaper’s history.” He had been waiting to unveil the web version of folders until it was live in the 2.0 Pro version of the Instapaper iPhone app, but apparently Apple has been really slow at approving it (no surprise there), so he rolled it out early. Another big update is that you can now subscribe to other Instapaper users’ Starred items, making the service social. 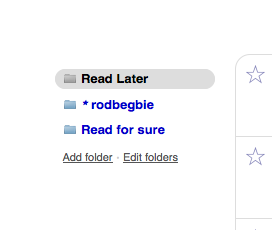 The advent of the folder feature allows for this, as when you click on the “Add folder” link, you now have an option to add another users’ starred items simply by typing in their Instapaper username. Those items are placed in the left-hand sidebar of the Instapaper site, and when you click on a user’s name, you will see all their items just as you would your own Instapaper items. Starring an item in Instapaper works and looks exactly like the same functionality does in Gmail. But before this feature, there wasn’t much of a reason to star items beyond further highlighting what you’ve already bookmarked. Now there is a reason — to share things. 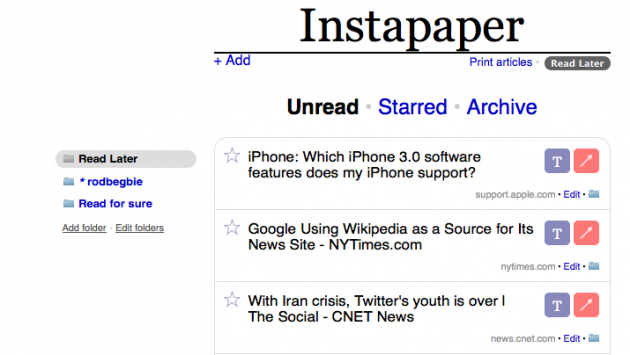 At the core of Instapaper is its bookmarklet, which allows for one-click saving on items on the web. That too has received a nice upgrade. Instead of popping open another small browser window to let you know something is saved, it’s all done on the actual page you are saving now as a quick overlay. Apparently, this works better for the new Safari 4 web browser. And finally, Arment announced that the current version of Instapaper Pro, the premium version of the iPhone app (there is also a free version) is available for $4.99 for a limited time, as Instapaper 2.0 looms. This is a nice reduction from the app’s normal $9.99 price and if you buy the current version (1.3) at this discounted price, you’ll still get the full 2.0 update for free. You can find the app in the App Store here.